As a social media marketer who provides social media services for small business, big business or any size in between, you have to know what you’re doing. Which means you need to be accountable for what you do, in addition to doing it right. In order to learn from your social media you have to measure your campaigns. It only makes sense that knowing what is working, what isn’t, and ideas to improve will make you a better social media marketer. Also, it’s important to know whether the money you’ve invested in your social media marketing services have provided a return that’s worth what you’ve put in. It’s hard to know whether the time and resources put into your social media posting schedule are yielding a return. That’s why you need to measure! The first type of measurement helps you monitor the ongoing conversations that are happening on social media regarding your company and brand. You can set it and forget it, and just check in when you need to download your results. Campaign-focused metrics are more tactical. They help you analyze how specific initiatives perform, and they vary from campaign to campaign, and depend on your goals for each campaign. To measure social media efforts effectively, you need to implement both tactics. Make a list of what the goals you’re trying to reach with all of your social media marketing efforts. Social media can be used for a lot of different things, from updating fans and followers about news and other company or industry information, to answering questions and engaging with your community. What are your social media goals for each campaign? Does your social media management software provide you with the right measurements to meet your goals? Things like reach, amount of likes and followers, reach, shares and Use metrics like volume, reach, exposure, and amplification. How far are your messages reaching? Your comments, shares, replies, retweets and post likes are your metrics for engagement. The amount of people participating, how often they do and in what way are things to think about and measure. In terms of content marketing best practices, this is one of the most important markers of where you should be going with your content plan. When you’re measuring your referral traffic, aka the traffic coming to your website from social, you need to track link shares, clicks and conversions. Are people clicking on your calls to action to your landing page or website? What are they doing once they get there? Your fans are more than just your engagement score. Some of your fans can be influencers. Pay attention to who is interacting with your social media accounts and what sort of impact they have. 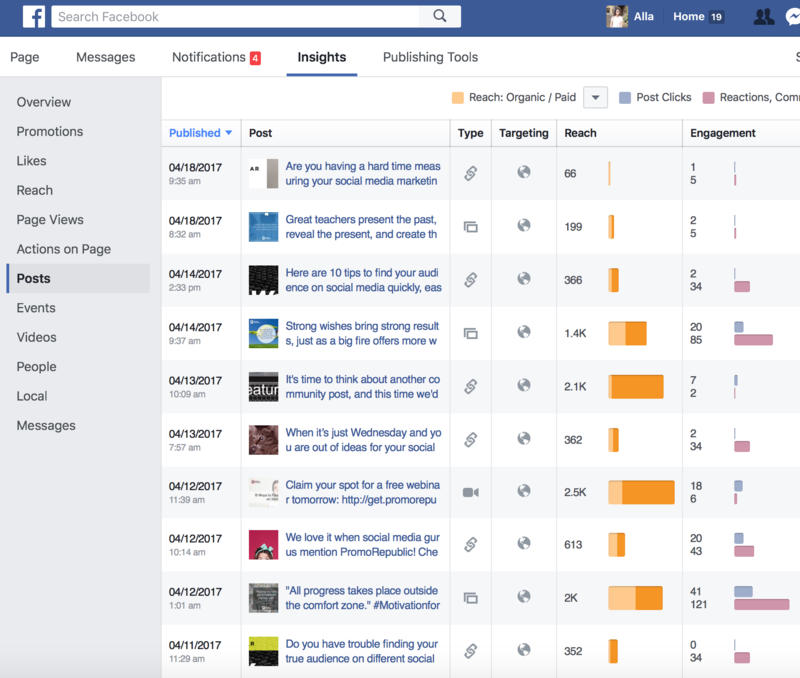 Facebook Insights provide you with a full information on your posts. You can easily define which post was and was not successful with post reach and engagement. You don’t need a 2017 Facebook marketing guide or tips to figure it out. Just click the insights tab and as long as you have over 100 fans, you’ll have data. 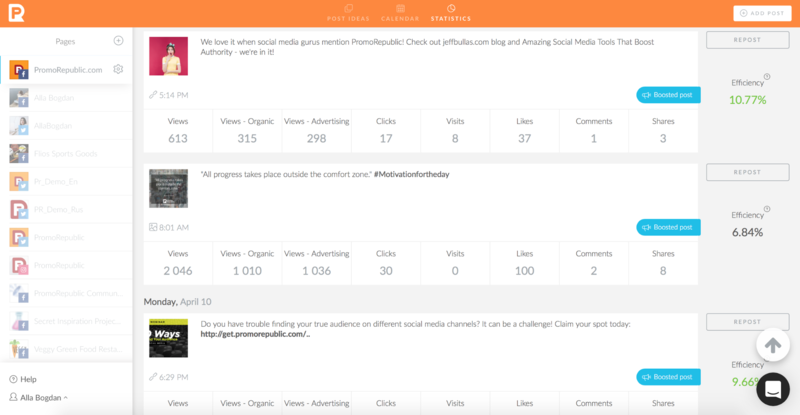 In addition to offering content creation template capabilities, super pre-made posts, all in one social media content generator, PromoRepublic‘s statistics can help you monitor the success of your posts. 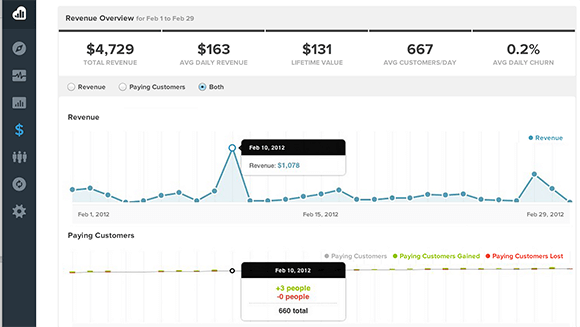 The statistics update once per day and they’re available only for business pages. You will receive unique statistics for each of your pages. You can choose a certain period of time you want to see statistics for – and you can filter to view a post’s effectiveness by views, visits, clicks, efficiency and likes. You can also monitor the number of organic and paid view separately. Tap repost to publish your post again on any page or group you’ve connected to PromoRepublic. 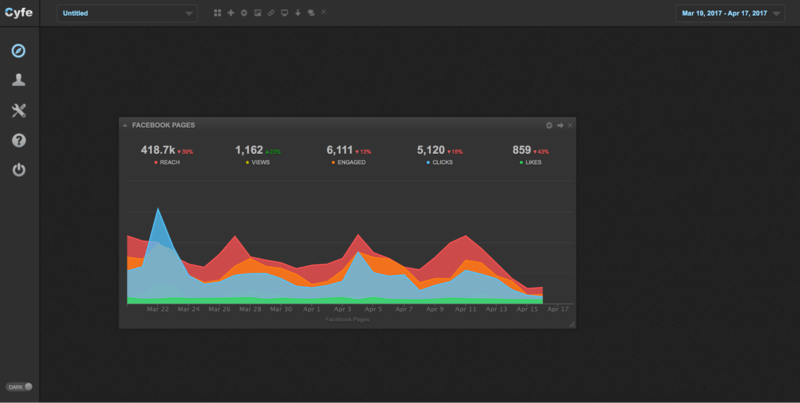 Social media marketing automation includes visible and easy to understand metrics. This tool allows you to track the return on investment coming from Twitter, LinkedIn, Facebook or your actual website and it matches the conversion credit to the social media channel it comes from. This allows you to keep your finger on the pulse of your customer lifecycle in terms of where they come from and what they do, more accurately. This is powerful when trying to prove the return on investment you get from social, especially if you’re seeing your paid ads on social work and convert. In terms of your customer lifetime value, RJ Metrics’ Cloud BI is something that automatically calculates that particular funnel, and breaks it down to show which social media channel brought you which customer. It also offers a handy churn analysis that gives you an idea of your customer behavior and information you need about marketing return on investment and how it relates to customer acquisition cost. This tool gives you a huge amount of information that will tell you how your content is being shared across your different social media channels as well as the impact it is having on your overall return on investment. 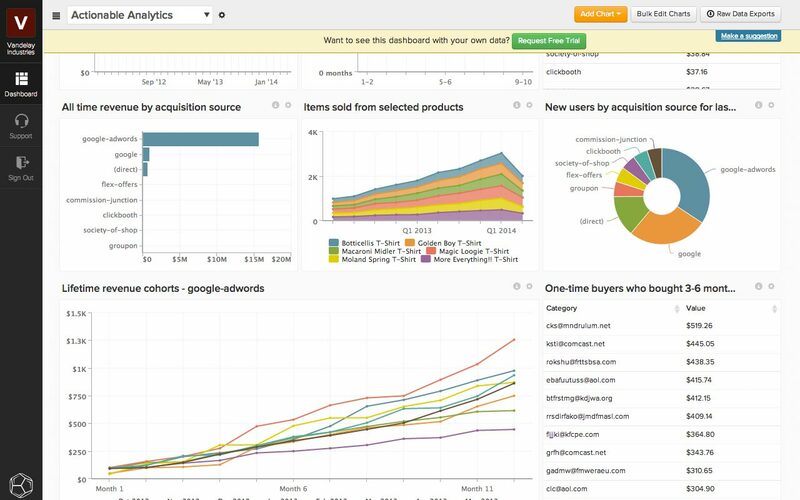 Widgets will help you build custom dashboards that keep track of Google Analytics, Twitter Ads, Facebook Ads, and whatever else you want to track. But in order to have good metrics to track, you have to be posting awesome content. If you really want to move the needle, these are the types of posts you need to think about adding to your content creation for social media. Keep in mind that a great way to publish the right amount of content on multiple channels is to use a social media calendar. Remember, content creation for social media is as much art as it is science, so it’s good to post a diverse range of content to interest and engage your fans and followers. When you manage a social media calendar for small business, big business, or even for your own brand, you need to pay attention to content creation examples that fit your particular audience. Since there is no official social media marketing guide or content marketing guide that tells you exactly what your audience wants to see and when, you’ll have to do as much research on demographics and engagement as you do on analytics to be able to offer the best social media marketing services for your clients.